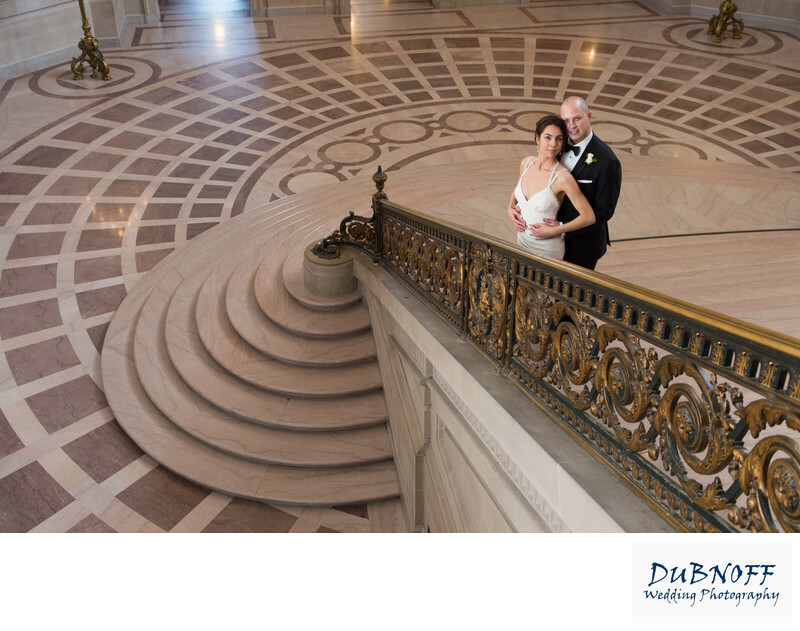 This is not an angle you see that often when looking at San Francisco City Hall Grand Staircase images. I am not saying I invented it, but I am one of the few who have posted this angle. It's unique in that it not only shows some of the steps, but also features the pattern on the floor. Other view points don't display this very unique floor design that is very rare in architecture. The obvious challenge with this photo is the people and tourists down below. We took this photo in the early evening when less people were milling about. We asked the couple to wait in that position until I had a clear view. Once the tourists and other photographers cleared away I snapped off a dozen quick shots. It's important to get this shot without people in the background because removing them with Photoshop is almost impossible. The complicated pattern you have to draw back in to make the floor look correct is very tough to do effectively. I thought this would be a good place to mention how we edit and fix our images for our clients. We offer Photoshop service to our clients who order albums or prints. We cannot Photoshop ALL of your proofs, but we DO edit each one of them carefully. What is the difference? Basically we make sure that all of the images you receive from your city hall shoot are color corrected, exposure corrected and cropped. They all must be ready for you to print or share on Social Medial or we will not release them to you. However, when it comes to removing tourists and other brides and grooms we have to limit that to some extent. As mentioned, if you order and album or print we will retouch and Photoshop each selected image to make sure it is perfect and has no people in the background when possible.